Its always great to hear that our video has helped peoples health. We would like to thank everyone who has bought our videos and thanks for letting us know what you think about it too! 050's 2 Not just for the over 50’s! As a ski instructor, practising Pilates is very important to me. Having a strong core is vital for my athletic performance, but also for the day-to-day parts of the job - such as picking up beginners without hurting my back. Being 22, this DVD is not just for the over 50’s! I find it incredibly useful as a means of keeping on top of my fitness as well as providing some time to focus on myself after a busy day spent with other people. 050's 1 This is the first DVD I have done regularly, because it is easy to follow and just enough for me on a daily basis (70 something and not that fit!). I can already notice my stomach is flatter which is a great start - wish this instructor would produce a couple more programmes for variation. The only small criticism - some background mood music would be nice. 050's 1 I bought this two years ago and my back is 90% improved. My balance has also improved. I wish i found it 30 years ago. 050's 1 Great pilates dvd that focuses on improving fitness, stamina, strength, posture, balance and mobility. Two easy to follow workouts. This would benefit anybody and not just those over the age of 50. 050's 2 Very well presented, good details for a beginner as well and a natural progress from the first beginner DVD. 050's 1 Started this just before Christmas, have never done Pilates before, but I'm now joining a class as I feel I could fit in now. I just wanted to say how much I have enjoyed both the over 50's DVDs. You explain each step really clearly so that it's possible just to focus on listening rather than having to keep watching to see what to do and I really like that you pick up on the small things that you need to remember to keep the whole body in balance during the exercises. 050's 2 This is a great DVD for over 50s who want to do some exercise but who can't manage more energetic workouts. The instructions are clear and the exercises flow into one another in a very natural way. There is no annoying music in the background and the explanations of the exercises and how to breath while doing them is very helpful. 050's 2 Excellent for beginners who want step by step instructions. Pilates really is suitable for all ages and does make a huge difference, even though it does appear at times to be quite a simple,slower form of exercise. Have had years of back problems and a slipped disc two months ago. One session of pilates always makes me feel better and much more supple. 050's 2 Fabulous DVD! This works either as a home practice DVD for those with some previous experience (please don't think you need to be over 50!) for new exercise variations for teachers or as a recommendation to clients asking for a DVD suitable for home practice. Instructions are clear and precise throughout and there is a clear sense of flow and purpose to the main routine. Loved the short relaxation! I found the standing wall exercises really useful. This works either as a follow on to the first 'Pilates for the Over 50s' or as a stand alone DVD! Thank you Liz! 050's 1 I bought this for my mum who has told me that the teacher on this DVD is excellent as she shows you how to do everything. She is very pleased with it. Intermediate Definitely not for a beginner! DVD good quality and the work out is quite energetic. Not a relaxing work out but I feel great afterwards. 050's 1 Good video giving you easy exercises to do and in two parts so you can choose to do the whole DVD or pick whether you have time to just do one section and then do the other section at a later time. 050's 1 I bought the original Pilates for Over 50s in 2012 after seeing reviews in Saga Magazine. I have used it regularly ever since and I know it off by heart. I look forward to the challenges of this new one. 050's 2 If you are looking to do a home practice away from the your weekly class , I would recommend this DVD, easy to follow and excellent instruction. Intermediate A excellent DVD, I loved it. Clear, easy to follow and challenging. I would particularly recommend it for those who wish to keep up their Pilates at home, it ensures the excercises are accurate and pushes one just that little bit further. The benefits of this DVD are immeasurable in helping maintain a good posture and preventing, or putting right the aches and pains that can accompany aging and a poor posture. My own experience of Pilates has saved my sanity, suffering from persistent pain following surgery I can now, with ease, walk 2 miles a day, garden, generally lead a very active life and even touch my toes! 050's 2 I read the description carefully as I am both well over 50 and new to Pilates. This is not for the already knowledgeable but for people like me. I have practised yoga in the past but found this dvd far better at explaining the underlying philosophy and building up carefully and slowly to stretches and movements. The presenter's voice is perfect, knowledgeable but not grating. My husband is joining me on this new venture and he too agrees that is pitched perfectly to the over 50 beginner. I am delighted I made this choice and am bemused who think it too easy because it is absolutely clear whom it is for. 050's 1 Avery well organised DVD and in plain language and easy to follow. Simple and achievable. Easy to understand. 050's 1 This is a very good DVD for those who are just starting Pilates and supports any classes a person may be attending. Fairly low level activity compared to a live class. 050's 1 Good to see an exercise DVD for people over 50. Cannot do all the exercises because of a mobility problem with one of my legs but useful all the same. 050's 1 Good beginner's Pilates CD. Clearly demonstrates basic moves, positions and correct breathing techniques. 050's 1 Great instructor. She really has a connection with her clients. Good exercises for those who haven't had much experience or little in Pilates not matter what age. 050's 1 As a newcomer to Pilates I have found this very helpful. The explanations are clear and the exercises slowly increase in level of difficulty. I can follow them in spite of having back problems and the instructions tell you when to take extra care or avoid overstraining a problem area. Definitely for the cautious beginner. 050's 1 Very well structured so that there is no strain or potential "damage". I've learned to be constantly aware of my hip alignment. 050's 1 I purchased your DVD about 1 year ago and find that it is extremely helpful as I have MS and Pilates was suggested to me. I am age 52 and find these exercises challenging yet achievable at the same time, if that makes sense!!! A friend gave me a loan of a Pilates DVD with exercises for a flat stomach, however they were designed for “young fit people” as they were so quick I was unable to keep up with them. I thank you for the fantastic DVD as it has helped me immensely with my balance. I came to Pilates later in life, in my early 40's and have been practicing for 13 years. I had an early history of teaching aerobics in the 1980's, and as a result, suffered many injuries. I just can't say enough about what Pilates has done for me, not just physically, but mentally and spiritually as well. I am now about to embark on my own study to become a proper instructor myself, and recently discovered your 'Real People Pilates' DVD. It's my goal to eventually teach people who have had injuries and mobility issues, and I just can't say enough about the quality of instruction in the DVD. It's quite obvious that you have done the proper training, and your level of knowledge is an inspiration. Thank you so much for setting such a wonderful example for future teachers. Did quite a lot of research before choosing this DVD, and I am really pleased with it. Definitely for the older person, but its not patronising, just clear, easy to understand instructions. I particularly like the pacing, I don't have to keep pausing it to get into position, or check breathing, or body position. Have already recommended it to a lot of my friends. I have purchased your DVD and think it is great as I have recently been recommended to try Pilates by a health professional. I am age 51 and have only tried this a couple of times as I have only received the DVD. I have already noticed a difference and it has also made me sleep better! I have found your DVD really helpful and gentle and the instructions very clear. I go on to your website from time to time to see if you have made another one. It would be good to have a different routine at the same sort of level. I have tried other DVDs and find them quite good but yours I really enjoy. I have also attended classes but I do prefer your DVD which at seventy eight is helping to keep me mobile. As a very late beginner I can work at my own pace. It is so helpful to be reminded of the important co-ordination of breathing with movement. I believe that even after a few weeks I am finding a general improvement and I feel I have reason to be optimistic about enhancing my general well-being in the longer term, which is pretty good news when you're 82! I found the DVD really good and it helped me after my operation. Because you speak and do the exercises slowly I could follow it easily. I found it great!" Really good for those of us recovering from a surgery that prohibits us from doing a more aerobic type exercise. I have watched this Dvd many many times, I found it so easy to follow, each exercise was broken down into easy to remember segments, I felt re-vitalised after and will definately keep at it. I loved it so much, I actually bought copies for all members of my family who are now regular participants and enjoy it equally as much as me. This has helped me with back pain and created an awareness of the importance of deep breathing and maintaining correct posture. Liz provides a understandable explanation of the basics of Pilates. In addition, there is an excellent selection of floor and vertical exercises to observe and then follow. In following the clear and concise instructions that Liz gives for these exercises, I am more confident I am doing them correctly. Watching Janet, Syliva & Derek, people in my age range, doing the exercise with such ease is very encouraging. I also found the interviews to be reassuring and enjoyable. I have strengthened my core muscles which in turn helps the back pain and maintaining correct posture. The practice of deep breathing is helpful with pain, stress and provides an overall feeling of wellness. In addition to doing regular work sessions, doing deep breathing with a few exercises will alliviate pain experienced after sitting or standing for an extended time. Pilates & deep breathing has changed my life and I look forward to a sequel. Try it! An excellent DVD which provides a clear and concise explanation of the basics of Pilates. Liz's instructions for the exercises are easy to follow and observing folks my own age has been very encouraging. It has helped me to strengthen my core muscles which in turn has helped my back pain. In addition to doing a regular work session, doing the deep breathing with a few exercises will alleviate pain I experience after sitting or standing for an extended time. It's very easy to listen to and it works...try it! I have recommended this DVD to all my friends. This DVD is superb. The exercises are so clearly explained and enjoyable, and I feel certain it will make a significant contribution to my general fitness and flexibilty.I am delighted to have discovered it. Before watching this DVD, I had never been to a gym or attended an exercise class in my life but, having just turned 70, I thought it was time to get a bit fitter. I found the instructor beautifully clear and easy to follow and I felt the benefits of the exercises after only one week. I would highly recommend this DVD to anyone over 50 (or 70!). 50+ - Pilates is for you! Having watched this dvd I was motivated to start Pilates classes for myself. It has clear easy to follow moves - and the instructor - Liz is very encouraging with the three very enthusiatic students Sylvia, Derek and Janet, try it and see! 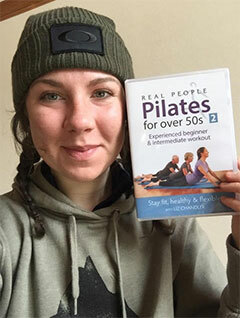 This is an excellent DVD and not just for the over 50s - ideal for anyone new to the Pilates technique as very clear and consise. As a Pilates instructor myself I will definitely recommend to my clients. I loved this DVD - it was wonderfully clear and easy to follow, the pace was perfect and best of all it works. I have found that after regular use it has improved my posture, really strengthened those 'core muscles', (no more flabby tummy!) helped with my back problems and also the breathing has improved my asthma so much that I no longer use my inhaler at all. Highly recommended. I liked the Pilates class for those with back problems, when I got there. It did gradually improve my back, my posture and my general well being. It really did prove beneficial and also enjoyable. I now attend a class at a local Health Club. It is true that one does need expert direction and I wanted the DVD to do some at home - that is why I ordered your DVD. I think it will work as a supplement to my once weekly classes. The instructions are precise and clear. A great introduction to Pilates and a friendly guide. Excellent! I highly recommend this DVD. Liz Chandler is an inspiring teacher and the workout is extremely effective. She talks very clearly in a friendly manner and explains everything so you understand why you are doing it. Firstly she explains the principles behind Pilates then she goes on to lead you gently through a series of standing and mat exercises. Although the DVD is aimed at over 50's it works equally well as an introduction for anyone. The clients she uses are older people and actual clients of hers rather than models and at the end there is a section where they are each interviewed and they give their thoughts on their physical background, how they got into Pilates and how it has benefited them.